Product #15464 | SKU 62VND | 0.0 (no ratings yet) Thanks for your rating! 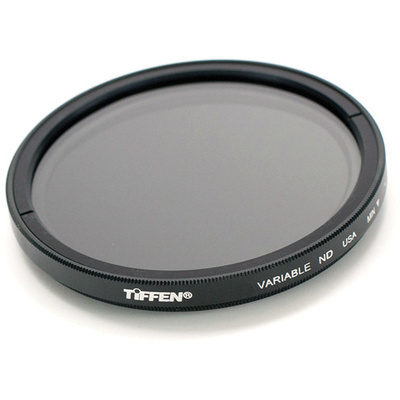 The 62mm Variable Neutral Density Filter from Tiffen offers a unique way of maintaining total control over your depth of field as well as presenting an efficient way to create some special effects. The filter is designed with a built-in rotating ring that controls neutral density ranging from 2 - 8 stops (0.6- 2.4). The heavier the density, the slower your shutter speed will be. This longer exposure allows the shutter to remain open long enough to record the same amount of light but will also create movement within the shot. Another major benefit of this filter is the elimination of having to buy and carry around individual neutral density filters. With this one filter, you can rotate to the degree of ND you want - a real time and money saver. The ColorCore process allows Tiffen to control the colour and density of their filters, and the characteristics of special effects filters with much greater accuracy than typical dyed-in-the-mass filters, which usually exhibit colour and density variations. In this way, Tiffen can better control the various densities of their filters and thereby create more exact degrees of filtration.